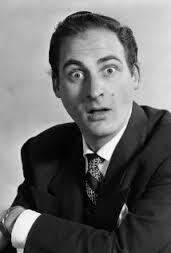 Although I am from an entirely different generation – my parents and grandparents grew up with and watched Sid Caesar on TV, I didn’t – I grew up hearing his name mentioned from time to time by my relatives and their friends. I can understand, after watching so much footage and hearing so much praise of him, why Carl Reiner would say this. But, still, my understanding is not the same. For a person like myself, who hasn’t grown up with Caesar, I am in a different position. And as a person who identifies with and situates himself within the history of Jewish-American comedy, I am very interested in what makes Caesar’s comedy “Jewish” or unique. After all, Reiner says in his Tweet that Caesar was the “greatest monologist, pantomimic, sketch comedian TV has ever known.” But as a schlemiel theorist what I want to know is whether or how any of what he performs relates to, adds on to, or revises the schlemiel tradition. I obviously won’t be able to answer this question in one blog entry or even two. It will take me time to really work through these questions. However, what I can say is that what strikes me about his comedy sketches is the fact that in his parodies of this or that figure he deeply engages the audience. And, in drawing them in, he, like a mystic, opens up a new space where one’s ways of thinking are, as it were, born for the first time. The awkwardness this creates makes for something revelatory and it does so by way of exposing the audience to a person who wants desperately to relate to them. One piece I am really interested in –because I am an academic – is a piece on “Professor Von Fossil,” the absent-minded archeologist from Austria. He is introduced by none other than Carl Reiner. Reiner is dressed up formally and takes on the serious tone of journalist who is looking to learn and share something with the audience. Right off the bat, the professor – who looks like a hobo – breaks with the norm by way of his greeting: he shakes Reiner’s hand twice, looks him straight in the eye, and says, with what appears to be great sincerity, that he is so happy to actually meet someone. In other words: he is truly grateful to make an appeal to the other. This solicits some laughter in the audience when he coldly turns and says “that’s enough.” The reaction is odd because on the one hand he draws the audience in – by way of his friendly and happy demeanor – yet, on the other hand, he pushes them away. When asked about the pyramids and their “architecture,” Caesar begins his answer in an academic way with the head down thinking and gestures. But the answer doesn’t seem to be coming. But then he breaks the rules by saying “look at the pyramids” – gesturing to the audience – repeatedly. This breaks the ice. The audience laughs because this is breaking with the role of professor. He is playing with language, gesture, and social mores. He is foregrounding language; and this is comical. He then goes off on a tangent about animals building things, and goes way off topic and even changes accents and speaks more in a person-to-person manner about animals and their ways. This also foregrounds the medium. This goes to the next level when he mimes out what a translator had communicated to him regarding the writing on the walls around the big hole. Drawing his finger back and forth and using a dialect that seems middle eastern, Caesar takes us through an absurd translation (replete with a gaze, gestures, and odd tones). The effect is mystical and fresh as it goes beyond the limit: where after all will this go? We don’t know when the translation-slash-movement will end. It has an animated character that goes against all academic decorum. In other words, we were duped. He is not talking about some ancient artifact; he seems to be talking about something contemporary. This punch line evokes the greatest laughter. The joke is on academia, really. For after Reiner asks him a very academic question, Caesar mocks him on the side as if his academic question is…too academic. This appeals to the audience which now sees the Professor as a jokester and a simpleton. He’s not really a stuffy academic. The last three jokes – especially his book with the matriarchs in Cincinatti – also show us that he is really not so academic as a hobo of sorts. And the last line of the routine contrasts with the first: instead of embracing him he tells Reiner to “get out of here.” But the audience knows he can’t be serious; after all, the professor doesn’t mean anything he says. He is the everyman; the simpleton. His anger really isn’t anger and his seriousness is really not serious. That’s what makes him so funny. And that’s what makes him a Caesar of sorts. The schlemiel teaches not to take ourselves so seriously; but, while in Europe the schlemiel is a luftmensch, in a tele-visual America, in a country guided by entertainment, he can be a leader. Herein lies the secret of popular, comic, mysticism….